Konecranes has supplied the automated container handling system for the Lamong Bay Terminal in the Indonesian city of Surabaya, East Java, which was inaugurated by President Joko Widodo this month. 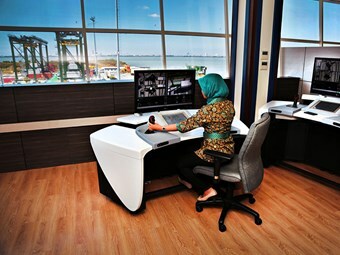 A Remote Operating Station (ROS) room at Lamong Bay Terminal. The terminal is the jewel in the crown of Indonesian state-owned terminal operator PT Pelabuhan Indonesia III (Persero), also known as Pelindo III, and is seen as an important milestone in the country’s transport development program that is improving the movement of goods through its vast waterways. Lamong Bay’s Konecranes system consists of 20 Automated Stacking Cranes (ASCs), Remote Operating Stations and associated container yard infrastructure. Konecranes also provided 10 Ship-to-Shore (STS) cranes and five straddle carriers. "Lamong Bay Terminal is the next generation container terminal," Pelindo III president-director Prasetyadi says. "Thanks to the reliability, productivity, predictability and safety provided by our Konecranes automated container handling system, we will provide our shipping line customers with uninterrupted, reliable container flow," he adds. "This will be the key to building up our business success in Indonesia and South-East Asia." The value of the contract has not been disclosed, but is known to be more than $140 million. Konecranes says the system it provided for the facility features a number of technological improvements including strong redundancy throughout the design plus an improved Remote Operating Station (ROS) and Graphical User Interface (GUI). The Active Load Control (ALC) technology, which eliminates container sway, has been improved through the use of an advanced and very precise machine vision system for detecting containers and container profiles. "As the container approaches the target, the container profile becomes more accurate," Konecranes says. "The effects of dust, fog, etc, are minimised. The system senses neighbouring container stacks from the point of view of the load and performs canyon driving." "This is an important day for Konecranes and Indonesia," Konecranes CEO and president Pekka Lundmark said at the inauguration ceremony. "The future is very bright for Lamong Bay Terminal. I’m confident that it will achieve lasting business success." 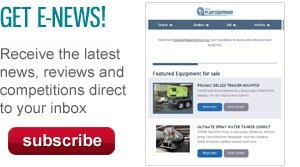 Click here to find new and used cranes for sale.